Lightning Cord Nylon and Fishing Line Braided:It was made with tangle-free design and easy to clean itself.Thanks to the Fishing Lines Braided Cord,super easy to wipe out oil,dust,ink,water,sauce,mud from this charger cord.Upgrade materials delivered the cable for iPhone stronger,lighter, more durable than ordinary USB iPhone cables. More Durable:End Tip is able to plug in/out from iPhone over 8,000 times also fit most of iPhone cases.Aluminum Alloy Housing can survive from 8,000 bends.Fishing line braided cord is almost unbreakable, According to our test,This cable can drag a 1.2-ton car to move. Safe and Fast Charge:Reliable voltage control and High-Quality Copper wire,support max charging speed up to 2.1A and 480Mbs for sync data. Fully Compatible:This charging cable is for iPhone X/8/8Plus,iPhone 7/7Plus iPhone 6Plus/6s Plus iPhone 6s iPhone 6,iPhone5s/5c/5, iPad Air/Air 2, iPad mini/mini 2/mini3,Pad4th,iPod nano7th and iPod touch 5th and all iOS10/11 devices. Perfect Length:Come with 2pcs 6foot Lightning cable for iPhone and one 3foot iPhone Cable. 6ft is perfect for phone to get charged from power bank in backpack,get charge from back site in car or office and coffee shop, or you can be comfortable to reach wall outlet socket while lay on bed. 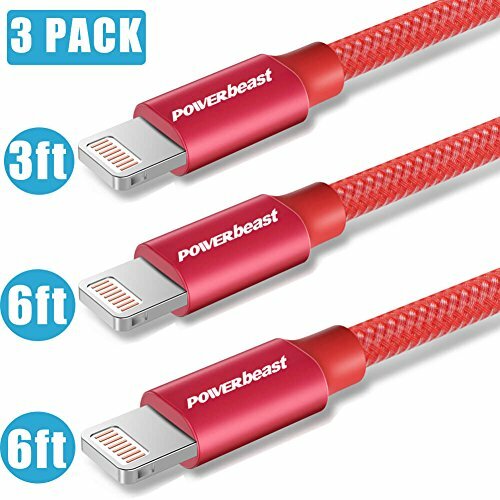 3ft is the best mate for phone get charged by car charger,USB charger or more.